Bluebird Cottage is just a little closer to the main Humphrey House, but is still tucked back into the trees. It features a living room with a "turret" eating area, wet bar, and TV/DVD. 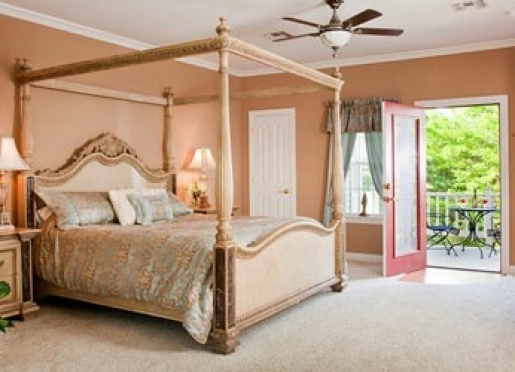 The bedroom boasts a king size four poster bed. The large bath has a sunken soaking tub, separate shower, and double vanities. 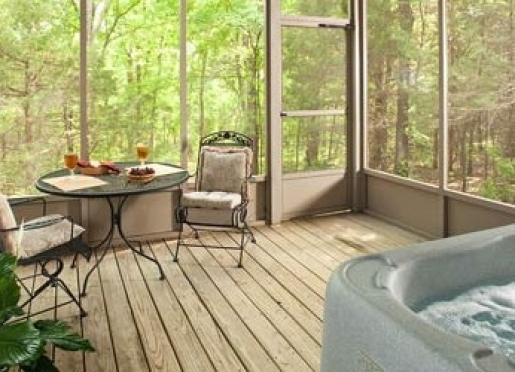 The screened deck holds the very private hot tub. 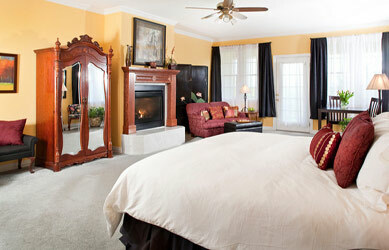 $239 per night for one or two adults. Roadrunner Hideaway cottage is so secluded it comes with a personal golf cart. Tucked back in the trees, this cottage features a living room lined with windows facing the woods... giving you the feeling of spacious seclusion. 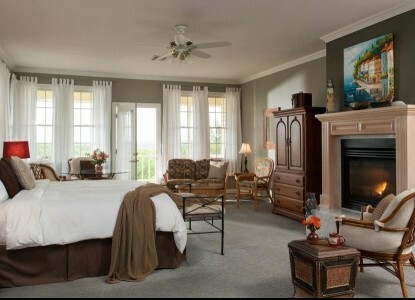 The bedroom includes a plush king-size bed. The spectacular bath has a 4' x 8' spa shower, a jetted tub for two looking out into the trees and a separate, enclosed toilet closet. 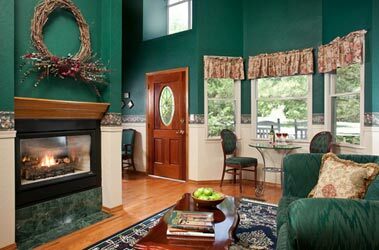 In addition to the full kitchen, which has a refrigerator stocked with soft drinks, water, and juices, this cottage contains two TV/DVDs and a screened porch with hot tub. Additionally, there is a back deck that includes a sitting area. $299 per night for one or two adults. Bambi's House is a cottage nestled in the trees. It has a living room and bedroom featuring a see-through fireplace between the two. 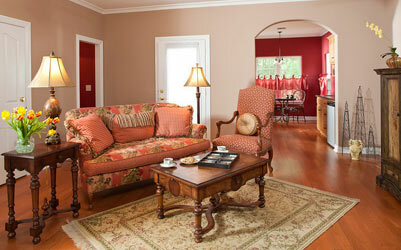 There is a cozy eating area in the living room, along with a wet bar. The bedroom contains a plush king-size bed and TV/DVD. The large bath has a sunken tub and separate shower. 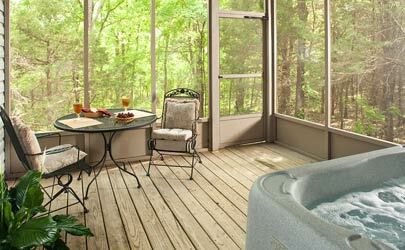 The screened back deck comes complete with a private hot tub. 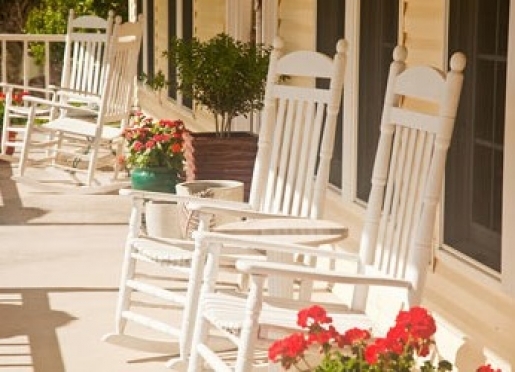 The front porch contains rocking chairs for you to relax as you enjoy the scenery. 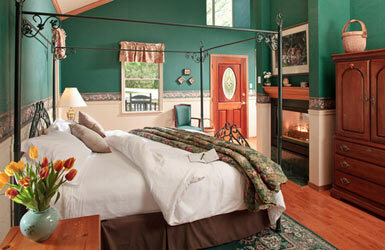 $239 per night for one or two adults. 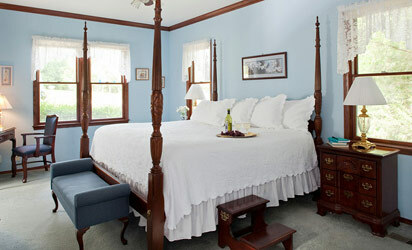 Butterfly Suite is a large, very private guestroom, located upstairs of the Humphrey House. 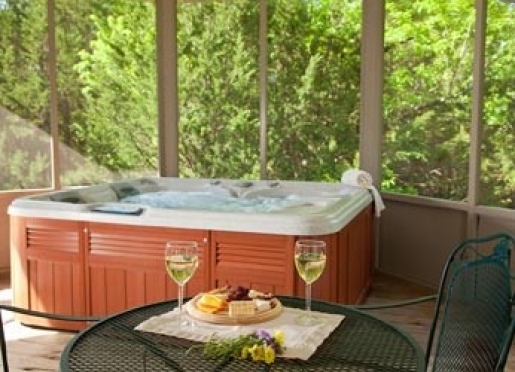 It features a whirlpool tub for two, along with a separate glass shower, a gas fireplace, a king size bed, a TV/DVD and a mini-fridge, stocked with soft drinks, water and juices. 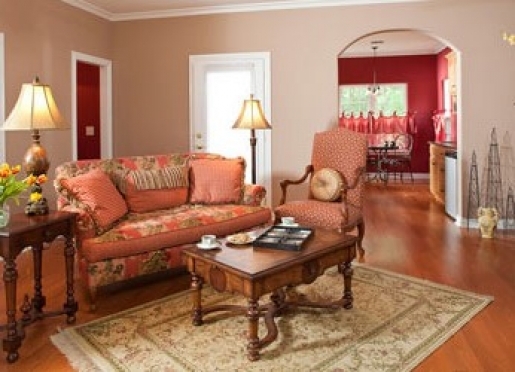 Two sitting areas give you a choice of a quiet reading corner or curling up on the love seat to take in a movie or enjoy the fireplace. 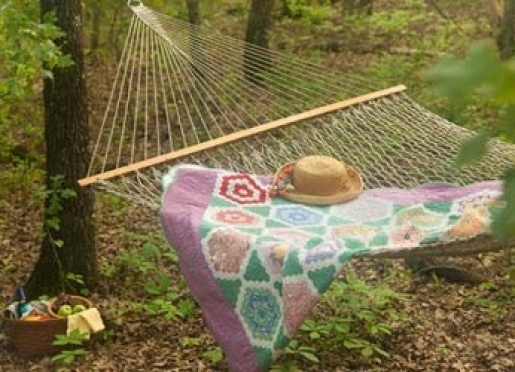 You may also step out onto your private balcony for a view of the wooded 73 acres. 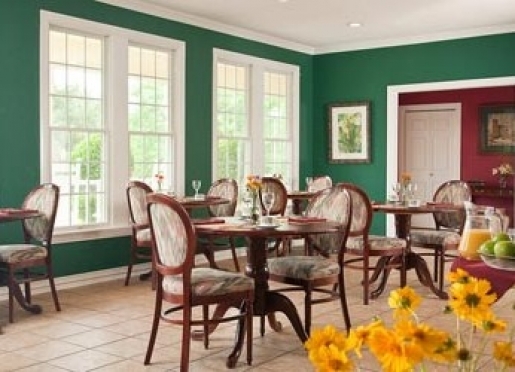 $179 per night for one or two adults. 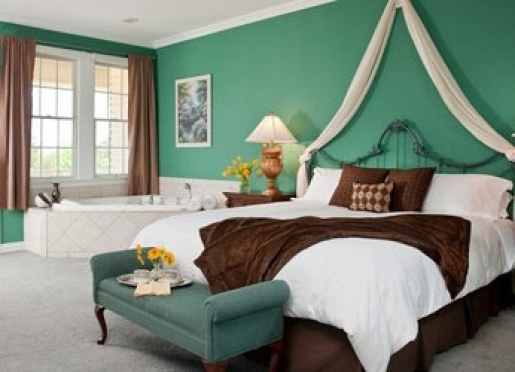 Tranquility is our most intimate guestroom, with a whirlpool tub for two tucked into a corner of the room ... just two or three steps from the plush king size bed. 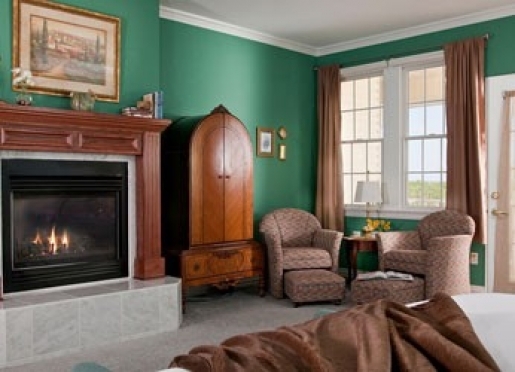 Opposite the large tub is the gas fireplace and an antique armoire holding the TV/DVD for those wanting to soak in scented waters while watching a movie or the flickering flames. 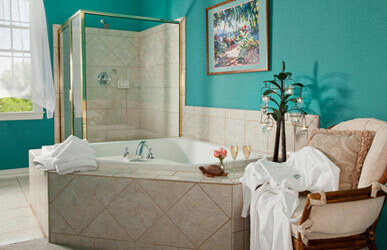 Attached to the large whirlpool tub is a hand-held shower. 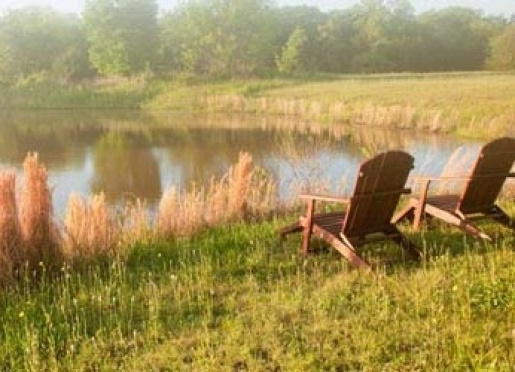 Two lounge chairs with roll out ottomans provide a quiet reading area or you may step out onto your private balcony for a view of the lush 73 acres. 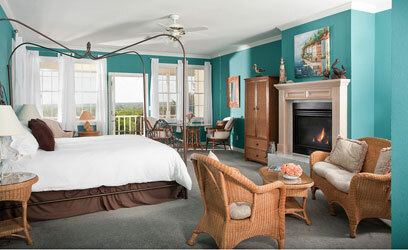 $159 per night for one or two adults. 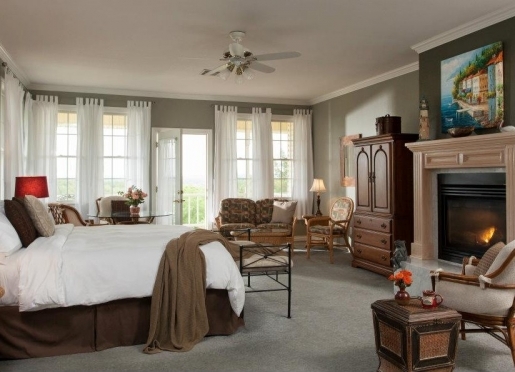 Taking luxury lodging to a new level, The Villa assures the ultimate romantic experience. This sumptuous two-story cottage features a downstairs living room, dining area with wet bar, and an outdoor screened room with private hot tub. 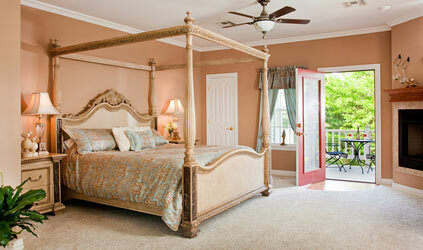 Upstairs you will find a romantic bedroom with a king-size bed. 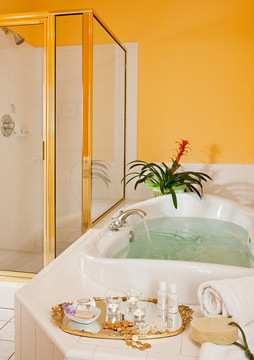 The bath features a large, glassed-in spa shower and a separate oversized jetted tub for two. This cottage contains two enclosed toilet closets and two TV/DVDs. 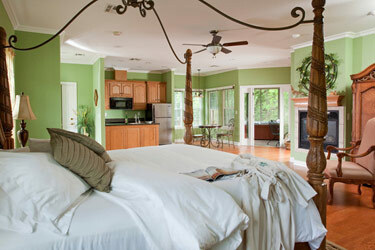 Additionally, this luxury cottage contains a second-floor balcony for you to enjoy. $299 per night for one or two adults. Suite Memories is located on the first floor of the Humphrey House. It has a corner fireplace and king size bed. 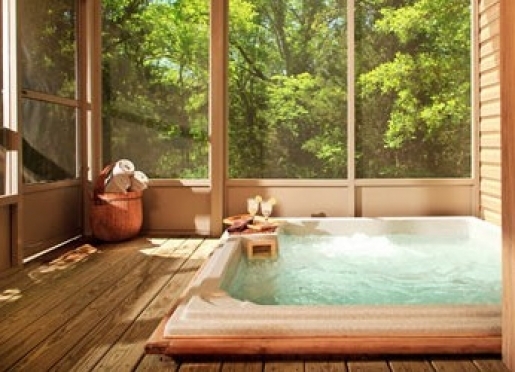 A private patio with a hot tub makes soaking your cares away just a step outside. The bath has a large soaking tub for two and a separate shower. With a gas fireplace, a TV/DVD and a mini fridge stocked with soft drinks, water, and juices, Suite Memories will give you sweet memories. This is our wheelchair accessible suite. 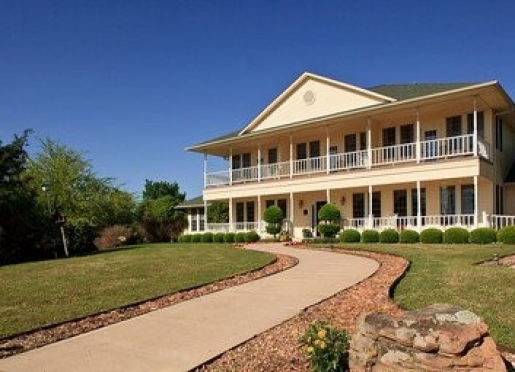 $195 per night for one or two adults. 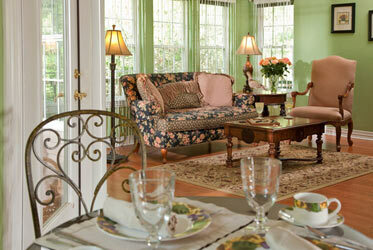 The Hummingbird Suite, is situated toward the back of the Humphrey House, on the first floor. It is very private with its own patio and large hot tub. It features a gas fireplace and king size bed, along with a TV/DVD and a mini fridge, stocked with soft drinks, water and juices. 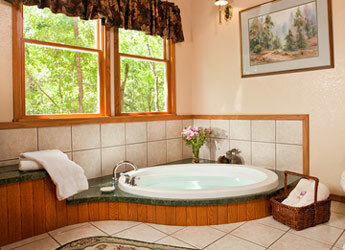 The bath has a soaking tub for two, a separate shower, and an enclosed, separate toilet closet. The cozy sitting area tucked under windows, gives you a great place to read a book or enjoy spending time with your loved one. 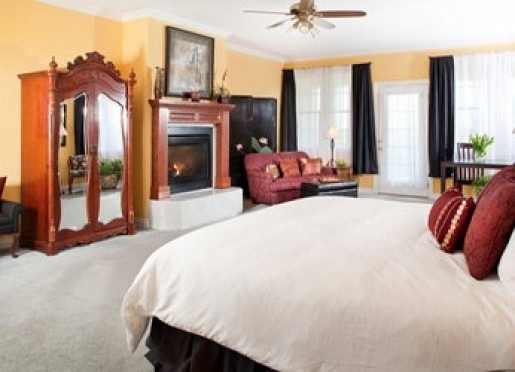 $195 per night for one or two adults. 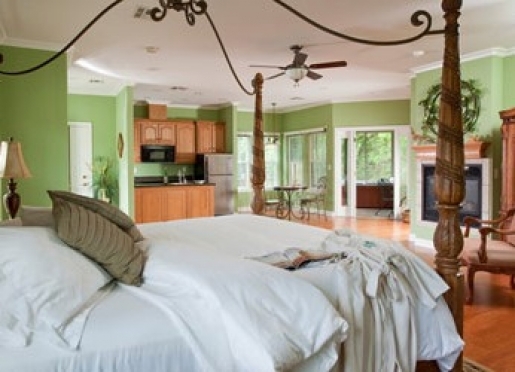 Pelican's Perch is upstairs in the Humphrey House and has a whirlpool tub for two, which is open to the room with a large glass shower just behind. 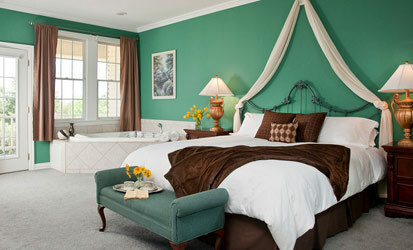 In this guestroom, you have a king size bed, a TV/DVD and a mini-fridge, stocked with soft drinks, water and juices. 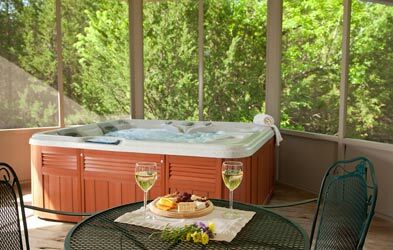 Step out onto your private balcony for an unparalleled view of 73 acres of nature or stay inside to enjoy your a gas fireplace and a sitting area, which includes a table & chairs. 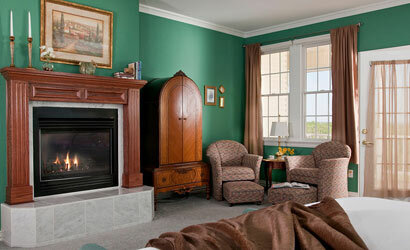 $179 per night for one or two adults. Breakfast: A full three-course breakfast is served in the Humphrey House dining room each morning anytime between 8:30 a.m. & 9:30 a.m.
Entertainment: A library stocked with hundreds of books and over 200 movies for guests' use in their rooms. Arrival and Departure: Check-in: 4:00 p.m. to 8:00 p.m. Check out: 12:00 noon Gated entry...the gate code is sent with each reservation confirmation. Smoking: This is a smoke-free property. No smoking is allowed anywhere. 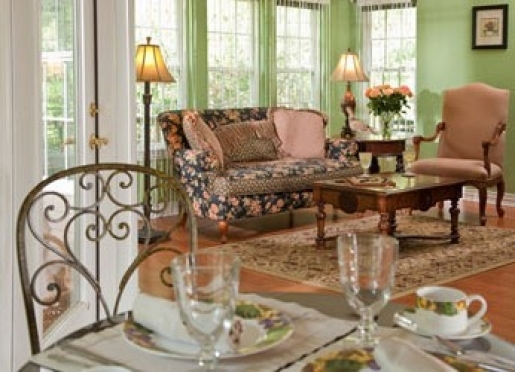 Number of Guests per suite or cottage: Maximum of one or two adults per suite or cottage. We do not have accommodations for children. Pets: We regret than we cannot accommodate guests with pets. Payment: Visa, MasterCard, American Express, Discover credit card accepted. Cash and personal checks also accepted. Deposits: Reservations must be confirmed with a credit card deposit equal to one night's stay. Cancellations: Reservations canceled more than seven (7) days before the scheduled arrival will be refunded the deposit minus a $25 cancellation fee. Reservations canceled less then seven (7) days prior to the scheduled arrival date will forfeit the deposit. 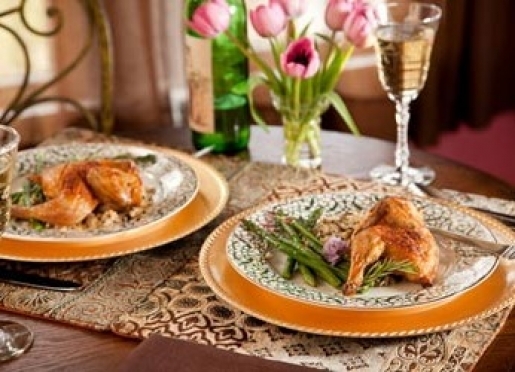 Dinner Cancellations: All dinner reservations must be canceled at least two days prior to the dinner date to avoid full charge. 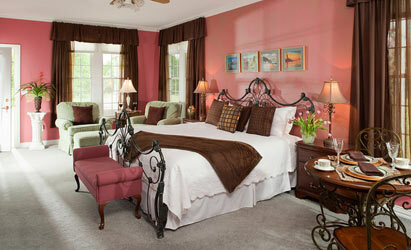 Corporate Rates: Corporate rates are available for midweek and longer stays. Please inquire. 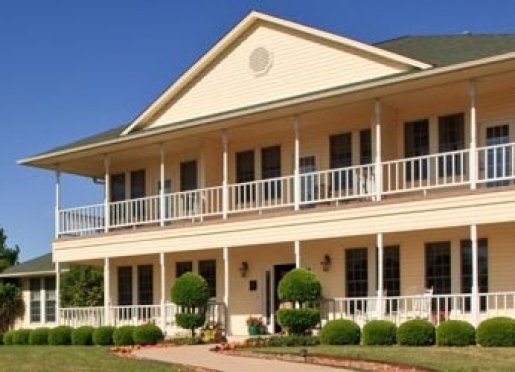 Thank you for making an inquiry about staying at Shiloh Morning Inn Luxury Bed & Breakfast.